When I was growing up in the 1960s, “midlife crisis” conjured the image of a fifty-year-old guy driving a red convertible sports car accompanied by a giddy twenty-year-old blond. Thanks to the Memoir Revolution, we no longer rely on such clichés. Instead, we can read detailed accounts of the infinitely varied experience of real people. In the first memoir of the series, Chickens, Mules, and Two Old Fools, when Victoria Twead reached midlife, she was itching for a change from dreary English winters. She convinced her husband that they should buy a fixer-upper in a village in southeast Spain. He agreed to a five-year trial. If they still loved it by the end of that period, they would stay. With the clock ticking, they began the laborious project of turning a dilapidated house into a cozy home. By most measures, that achievement would have been sufficient to declare their approach to midlife a smashing success. But for Victoria Twead it was only the beginning. The next mountain she wanted to climb was a literary one. She wrote a memoir about their move to Spain. Her good-humored writing brightened the dark spots, turning the whole messy experience into Chickens, Mules, and Two Old Fools. 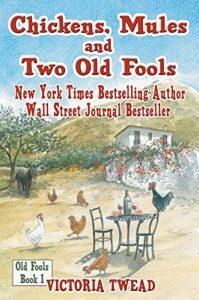 Their not-so-foolish decision to move to Spain followed by the even less foolish effort to write about it were merely the first couple of steps in what I have come to see as Victoria Twead’s ferocious response to midlife. Following Dylan Thomas exhortation, she was not going gentle into that good night. By this time, the reading public had discovered her books, and in a wonderful example of “art meets life” the income from her memoirs began to sustain her lifestyle. Victoria Twead’s relentless climb to higher versions of herself represents an important change in our culture’s view of midlife. Formerly considered the beginning of the end, many of us view the period as the beginning of the next interesting chapter. For a more serious exploration of this trend, read Marc Freedman, MD’s book The Big Shift: Navigating the New Stage Beyond Midlife. In it, Freedman points out that naturally, with our increased life spans, we are going to search for the next great adventure. This big shift in our thinking about midlife happens to coincide with that time in my own life. Once my age approached a half a century, it raised the possibility that my life was half over. Like Twead, I too wondered how to climb higher rather than sink lower. During my research into that question, I discovered that memoirs are the key, for me and many others in this situation. Victoria Twead offers a great example of the trend to see midlife as a time to grow. If you decide to follow in her footsteps, to boldly seize the future, to overcome your own limits, and grow toward a better version of yourself, keep in mind all three dimensions of her approach. First, if you lust for experience, go ahead and bust through your limits. Move to another country or achieve some other difficult or seemingly impossible dream. Second, whether or not you are inclined to a new round of adventures, turn to memoir writing to explore and share the experiences you’ve already had. And third, hop onto social media to create and join online communities and “party” with like-minded people from all over the world. I’ll say more about Victoria Twead’s approach to midlife, to memoirs and to community in my next article. Two Old Fools on a Camel, a New York Times bestseller. Victoria keeps publishing books! For a complete list, see her author page on Amazon. At Home on the Kazakh Steppe by Janet Givens. She and her husband joined the Peace Corps at around 50 years old. This entry was posted in Memoirs, midlife crisis and tagged ex-pat memoir, memoir, midlife, midlife adventure, midlife renewal, Two Old Fools, Victoria Twead by jerrywaxler. Bookmark the permalink.